Managing a huge collection of research papers has been the bane of scholars, no doubt since the beginning of written scholarship itself. In my particular case, mismanagement led to file cabinets stuffed with misfiled, crumpled, duplicate, and sometimes incomplete unreadable copies. Good luck finding papers or searching through the ones you may have forgotten about. Research on the Road: The current version of Papers gives you mobile access to a number of online repositories for scholarly research, including PubMed. The arrival of the PDF file, optical character recognition, and published online journals has presented a slightly different set of searching and sorting problems. Still, the organization problem remains. The desktop version of Mekentosj’s Papers ( ) brings the ability to manage journal articles, search your library and search the most common online repositories into a single desktop program. Now, Mekentosj brings this capability to the iPhone for on-the-go scholarship. Papers for iPhone tries to replicate much of the functionality of its desktop cousin and provides tools for reading and searching for scholarly articles. On the management and reading side, Papers for iPhone allows for synchronization of up to 1,000 papers from the desktop via a wireless connection. Files are specified by folder, in a way similar to the synchronization of iPhoto image collections and iTunes playlists. If you’re not using your quota of 1,000 there is the ability to synchronize random files based on a given criteria. You can also constrain the direction of the synchronization—files can be synchronized only from the desktop to the iPhone or can be synchronized bidirectionally, allowing any new papers acquired on the iPhone to be copied back to the desktop library. I’ve not found the auto-fill capability particularly useful but I suppose there are folks who occasionally need a random read. The second major piece of the app’s functionality is its ability to search online databases. Version 1.1 provides access to the ACM, ADS, arXiv, Google Scholar, IEEE Xplore, JSTOR, PubMed, and Web of Science databases. These are largely science-centric databases with JSTOR being the most broad. Interfacing with the wide variety of search engines is a bit challenging, as is evidenced by the fact that Google Scholar searches were broken in Papers’ initial release as a result of changes made by Google. The desktop version of Papers allows the various search components to be updated ‘live’ and Mekentosj has been quick to update when search providers change their products. Due to the constraints of the iTunes App Store, Papers for iPhone won’t be nearly as nimble when new updates are necessary since each update has to be cleared through Apple’s vetting process. 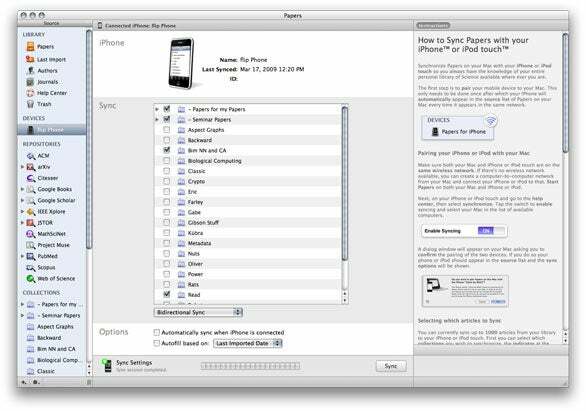 Sync Sensation: You can sync up to 1,000 papers from the desktop with Papers, much in the same way you sync photos and iTunes playlists between your desktop and mobile device. Switching between search engines on the mobile version of Papers is a little confusing, as there’s no obvious way to switch once you have started a search. You must click in the search box, as if to enter new search terms, and the list of search engines appears. I also experienced significant difficulty with the app’s proxy capability (e.g. the ability to access the search engines as though you’re on your institution’s network even when you’re not). Sometimes I was able to get connected and authenticated but, even when authentication was successful, downloading PDFs was a mixed bag—sometimes it worked, sometimes it didn’t. Some of this is likely due to idiosyncrasies of some sites (I had the most trouble trying to get papers via ScienceDirect) and their interaction with the iPhone’s WebKit implementation. Still, if Papers for the iPhone is going to be truly useful, this needs to be worked out. I found the app’s preferences slightly annoying in that they live in two locations, neither entirely intuitive. Some settings are in the “Help Center” while others are buried in the search engine panel. However, on the iPhone, preferences are a bit messy across the board—some live in Settings, while others are located in specific apps. Papers adds yet another confusing paradigm. 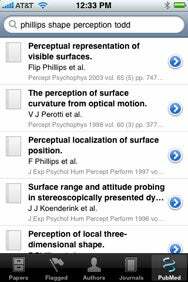 If you need access to scholarly research on-the-go, then Papers is certainly the go-to application on the iPhone and iPod touch. Unfortunately, this early release is reminiscent of the initial release desktop cousin—a great start that falls flat in a few areas. If the trajectory of updates are similar, I’d expect to see a more solid, usable application very soon. Papers is compatible with any iPhone or iPod touch running the iPhone 2.x software update.